Whopper's Bunker: Goldilocks' Planet's temperature "just right"... ...for LIFE! Goldilocks' Planet's temperature "just right"... ...for LIFE! Astronomers say they have found a planet orbiting a star a mere 20 light-years away that has the right conditions for life to exist. They are calling it the first "Goldilocks" planet, as its temperature seems to be "just right" to harbor life. "The planet has to be the right distance from the star so it's not too hot and not too cold that liquid water can exist," says Paul Butler of the Carnegie Institution of Washington. "And then the planet has to have the right surface gravity." The new planet, called Gliese 581-g, is different. But Butler has no direct evidence that Gliese 581-g actually has water. "What we know is that this planet exists at the right distance for liquid water, and that it has the right amount of mass to hold onto an atmosphere and to protect its liquid water on the surface," he says. "And of course, any subsequent discussion about life is purely speculative." But then he couldn't resist speculating: "That being said, on the Earth, anywhere you find liquid water you find life in abundance." 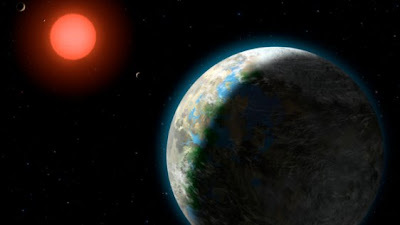 David Charbonneau, a planet hunter at the Harvard-Smithsonian Center for Astrophysics says the next step will be to try to analyze the atmosphere of this planet and other Goldilocks planets that are probably out there to see if they contain oxygen, another key chemical for life. Those findings are probably some years off, but Charbonneau predicts they will come. Master Warrant Officer "Chatterbox" Hendrickx issued a statement from the UNETIDA Public Affairs Office in Brussels, Belgium citing that the organisation was aware of the planets in question and the "imminent threat" they posed, but that there was no cause for "immediate panic." Which translates as they have no "unobtainum". I want to go to there . . .